Purchase 679 x 400 pixel digital file by using the Buy Now buttons below. You will receive an email with the download link. You can use the link 5 times to download the digital file. 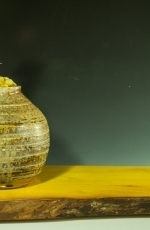 This stoneware bowl was wheel thrown and then altered. 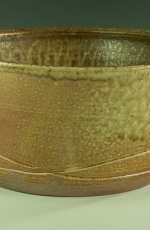 It is finished on the interior with a mottled brown ash glaze. The piece was fired to 2400 degrees F in a wood fueled kiln for about 32 hours. 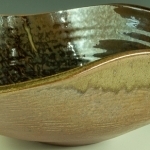 The exterior is unglazed but exhibits areas of ash glaze resulting from fly ash settling on the piece during the wood firing process and melting to form a glaze. The glaze is non-toxic and lead free. Dishwasher safe. Measures about 11” diameter X 4.5” high..
New artwork uploaded. 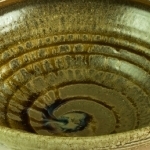 This stoneware bowl was wheel thrown and then altered. 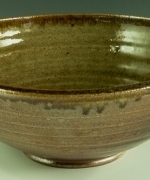 It is finished on the interior with a mottled brown ash glaze. The piece was fired to 2400 degrees F in a wood fueled kiln for about 32 hours. 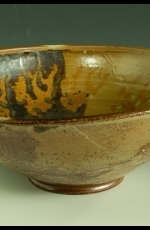 The exterior is unglazed but exhibits areas of ash glaze resulting from fly ash settling on the piece during the wood firing process and melting to form a glaze. The glaze is non-toxic and lead free. Dishwasher safe. Measures about 11” diameter X 4.5” high. FOIGHIDINN - The Scots Gaelic word for "patience" captures my journey through life and from the practice of architecture to the making of pottery. I am Canadian born and lived in Scotland as a youth. My family settled in New Jersey where I was raised from the age of 5. 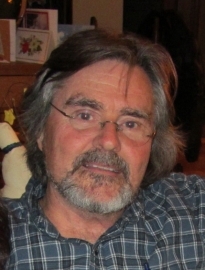 I earned a degree in architecture and practiced that noble profession for some 37 years, living and working in New Jersey; Savannah, Georgia and Winchester, VA. I eventually discovered pottery and retired from architecture, settling first in Berkeley Springs, WV and now in Hillsborough, NC. I enjoy experimenting with form, texture and color. I mix my own glazes from raw materials and use a variety of application methods to include dipping, pouring and spraying. 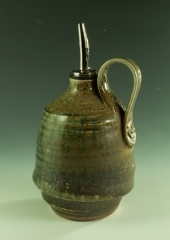 I work almost exclusively with stoneware and create texture by imprinting and excising the clay with a variety of tools. Texture on the clay body provides a wonderful "canvas" for applied glazes, particularly when they flow across the irregular surfaces and settle in crevices. 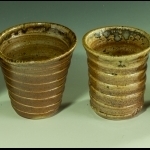 The resulting variations in glaze thickness create visible differences in appearance. 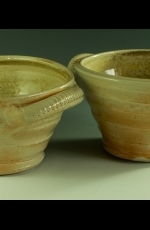 Like many potters, I fire my wares within the relatively controlled environment of a gas kiln, but my passion is the wild and wooly process of wood firing which often renders the serendipitous results achievable only via that ancient process. Pottery that's been wood fired exhibits a depth of surface resulting from the continued layering of wood ash over the 32 hour (in the case of my wood kiln) length of the firing that's incomparable in any other method of firing pottery. Additionally, the flame leaves its mark on the exterior surfaces of the pottery through the use of flashing slips. I have designed and constructed two wood kilns, the most recent of which - Cothrom Eile (Second Chance) - was located outside my home studio in Berkeley Springs and was fired twice a year in the autumn and spring. Each firing lasted approximately 32 hours and consumeds 2 1/2 to 3 cords of wood. I enjoy supporting my community in concert with my fellow artisans by donating work to support causes such as the "empty bowls" initiative. I have come to cherish FOIGHIDINN as well as the fellowship with brothers and sisters in clay. 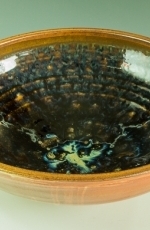 Additional information on my work can be found at www.ThistleGlenPottery.com.